MyMac: How difficult is it to prepare all aspects of your digital editions? O’REILLY: Most of our books are produced using an XML-based production process and toolchain. While it wasn’t easy or cheap to build that out, now that it’s in place we are able to use a single source to generate print, PDF, EPUB, Mobipocket, iPhone, and Android editions of the books. MyMac: What is the price differential compared to conventional print books? O’REILLY: For ebooks sold directly from oreilly.com, most are priced at 80% of the price of the print book. We are paying close attention to prices on various ebook devices and stores, and are doing some experimentation of our own to try and measure the price elasticity of demand for digital books. MyMac: How successful have you been at informing, educating, and expanding your readership? O’REILLY: Digital books outsell print books more than 2:1 on our website. So pretty good, it would seem. MyMac: Where do iPhone/iTouch, Kindle, BlackBerry, and other small format devices fit into your evolving technology? 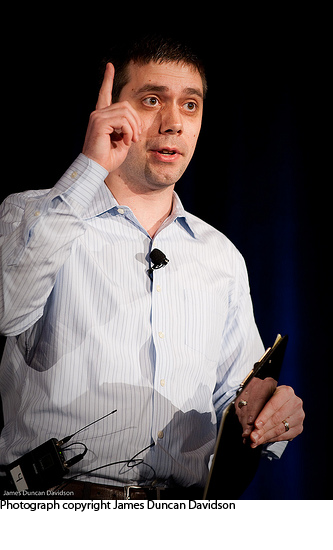 O’REILLY: Mobile devices are absolutely the most important digital channel for us right now. There are 40M iPhones around the world, and some estimates are that there will be at least as many Android devices within a year. That’s one or two orders of magnitude more smartphones than ebook devices, so it’s simply going to be a bigger market. MyMac: Which titles are most popular, and which ones don’t have any traction? O’REILLY: It depends, though not surprisingly, something that sells well in print tends to sell well electronically. For example, David Pogue’s iPhone: the Missing Manual is a top seller in print, on Kindle, and as an iPhone app. Surprisingly, heavily technical books (like Programming PHP and Unix Power Tools) are doing very well on iPhone. MyMac: In what formats are your digital books available? O’REILLY: For sales from oreilly.com, for most books we offer EPUB, PDF, and Kindle-compatible Mobipocket (all without any DRM encryption). Customers also get free lifetime updates. MyMac: Who are your major competitors, including the TidBITS Take Control series? O’REILLY: We have a great relationship with TidBITS (they are one of our partner publishers) and their titles are available through many of our digital channels (with more to come soon). Wiley, Pearson, and Microsoft Press are large competitors for our audience, and smaller publishers like Apress and Pragmatic Press also keep us on our toes. MyMac: How do you handle piracy and bootlegging? O’REILLY: Tim O’Reilly said it far more eloquently than I ever could. (See link at the bottom of this article.) We don’t believe that bootlegging is equivalent to lost sales. While we want and expect our customers to respect copyright law, we have much better things do to with our time and resources than annoying legitimate customers in a futile attempt to stop the perceived threat of piracy. MyMac: We know that static publishing has little to do with interactive ebooks, or with ebooks that are continually updated over the Web, but even such interactivity is rather primitive still. What do you see in the future for the interactivity of your works offered? Such as the ability for a customer to add a question, review, suggestion, rebuttal, or improvement to the end of the ebook, as well as the reader having the ability to remove, suppress, or highlight these? For example, see “Programming Scala“: There’s a comment link after every single paragraph in the entire book, and readers (and authors) can subscribe to RSS feeds to be notified of new comments. It’s just Web-based right now, and there’s of course some room for improvement in the interface, but there’s a lot of potential with a system like that for integration with other readers. Another nice example is Book Glutton which brings annotation and commenting to books. As for rebuttal and improvement, we’ve tried to borrow heavily from the software world and provide easy ways for readers to let us know of problems, and easy ways for us to let people know what’s been fixed. In that sense, we try to think of them as bug reports. Here’s an example. 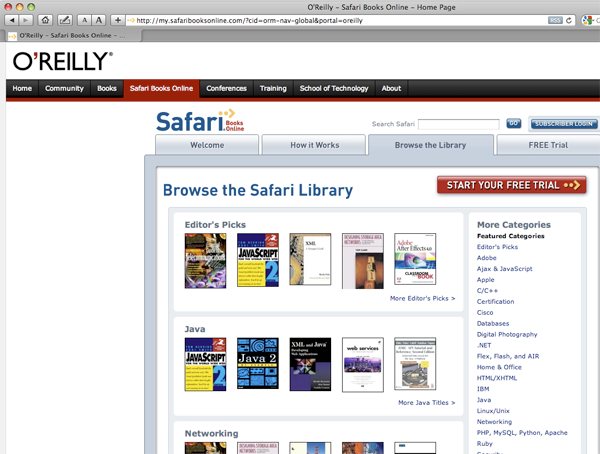 MyMac: Where do the ebooks you offer in Safari fit in all this? Weren’t they the beginning of it all? O’REILLY: The market for individual downloadable ebooks has only recently matured. Until recently, there was a lot of confusion around the proliferation of formats, and no one had really made a compelling device for reading this stuff. But with the adoption of EPUB as a standard, and the emergence of Kindle and especially iPhone for mobile reading, we’ve seen a huge uptick in interest and sales of ebooks. Before these recent developments, Safari Books Online was really our only ebook play, and it’s been a great success for us (it’s now 20% of our overall business). It’s a perfect product for a certain type of customer, one that wants or needs the ability to search and reference a full library of books and videos, even though they may only need a single page or snippet from any one item to address the task at hand. Now that readers are growing more comfortable with downloadable ebooks, Safari is working hard to find ways to incorporate that (along with the kind of social features you asked about earlier) into the service. Despite our enthusiasm for the ebook market, Safari remains our largest digital channel. MyMac: Will there be a book forthcoming from you in the future that gives a history to your company? Is there a link to such a history now? MyMac: What would you say to anyone who wanted to submit material to your publishing company, beyond the O’Reilly community? Please explain the community at your website, and how important is it to your success. O’REILLY: We accept proposals from our website. The community we foster through our books, our online publishing, and our events is a key component of our success. Our mission as a company is “Changing the World by Spreading the Knowledge of Innovators.” In practice that means trying really hard to figure out who’s doing interesting new things, so we document how they do it, and spread the knowledge needed for others to follow them. MyMac: Besides all the phones and iPhones out there, there are so many other ebook readers, such as Papyrus, BeBooks, Cybooks, eSlick, iLiad, Libre, and Sony’s PRS-505, as well as all the Wii, Playstation, and XBox platforms. Do you have any plans to break into any of these with your ebooks? O’REILLY: We want to be wherever our readers are, and make sure our content is available whenever and wherever someone is interested in it and willing to buy it. While we must of course prioritize our efforts, we’re in talks with dozens of resellers and device makers, and you can expect to see O’Reilly ebooks in many new and interesting places in the coming months. MyMac: What plans do you have to produce your ebooks in other languages, such as Chinese? O’REILLY: We already sell German language ebooks (both from http://oreilly.de, our German subsidiary, and on the iPhone), and absolutely expect to sell ebooks in other languages as well. MyMac: Why do you think the Android platform will become so popular so soon? MyMac: Do you have a business model in place or in planning that will include a free eBook (format of choice) with the purchase of a hard cover or paperback O’Reilly book? Or vise-versa? O’REILLY: That’s one option that we’ve definitely talked about internally, and is something we’d be willing to experiment with. MyMac: You say most of your books are produced with an XML application. Does this provide features to your books such as as a full text search with search words highlighted in the text, a Table of Contents allowing the reader to jump to any chapter in the book, the ability to adjust the font size for optimal viewing, remembering the page you were on to return instantly each time you run the app, or a progress bar? O’REILLY: XML is a markup language, not an application. The things you’re describing are capabilities of a particular reading system (web browser, PDF reader, ebook device) not inherent in the underlying markup. But most of the features you describe are parts of the current popular reading systems, such as Stanza on the iPhone (our iPhone apps are built using the Stanza technology), Aldiko on Android (our Android apps are built using Aldiko technology), and the open-source EPUB reading system Bookworm, which we sponsor. MyMac: What are the usual features of your ebooks, such as navigation? Text changing or enlargement? Landscaping or portrait changing? Notation or bookmarking? O’REILLY: Again, these are features that depend primarily on the reading device or system. We do our best to make sure that the PDF and EPUB ebooks we sell contain all the information needed for customers to take full advantage of whatever reading system they’re using. For example, all of our PDFs include navigation bookmarks and both internal and external hyperlinks, so that as along as the customer is reading the PDF with a system that supports those features of PDF, they can use them with our ebooks. But as a counter-example, the Amazon Kindle DX can read PDFs, but doesn’t currently support those navigation features. So while our ebooks contain navigation links, someone reading them with a Kindle DX won’t be able to use them. That’s Amazon’s fault, not ours. MyMac: Thank you, Andrew and O’Reilly Media. URL to learn more about O’Reilly’s digital media online content and store.